For some people, to say times are tight financially is an understatement. A recent Bankrate survey revealed that three out of five Americans are only one medical emergency or unexpected car repair away from emptying their savings, if they have any savings in the first place. Part of the reason is that many of us don’t take the time to properly budget — especially not the slow, inconvenient old-school way, via pen and paper. And we all know how well tracking cash in our heads works out. It generally doesn’t. The good news: It’s never too late to master your finances and start saving. That’s where today’s web and mobile financial apps come in handy, making it easier and faster to scrimp and save than ever before, sometimes automatically. Here are three of our favorite free apps to help you start saving money now. 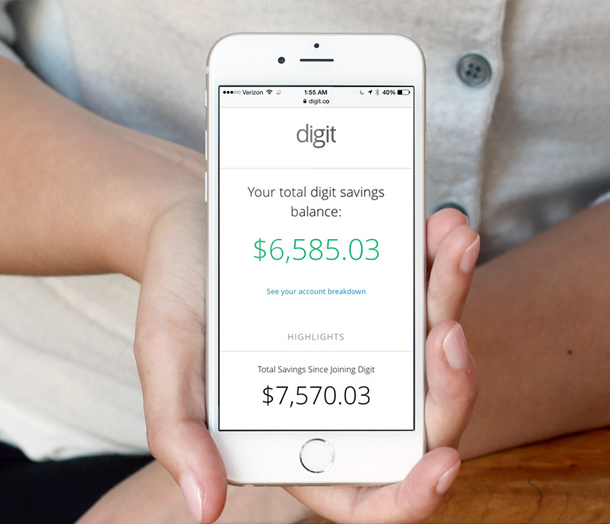 If you’re among the one in three Americans who hasn’t saved a single penny for retirement, Digit aims to get you stashing cash pronto. It’s a web- and texting-based digital piggy bank app that “automates your savings so you don’t have to think about it.” We like the sound of that. Digit dials into your checking account (with your permission) and studies your income history and spending habits. Using an algorithm, it then crunches the data and figures out how much you can afford to save. Every two to three days, the Google Ventures-backed tool transfers small amounts of cash from your checking account (typically between $1 and $150) and funnels it to an FDIC-insured Digit savings account, notifying you all the while via SMS texts. The startup guarantees that it will “never transfer more money than you can afford.” That way, you need not worry about overdrawing your checking account. Digit users can access their nest eggs 24/7/365 via text message. Transfers are free, unlimited and have no minimums. The only drawback is that you won’t accrue interest on your savings as digit accounts aren’t set up that way. But, hey, when you hit your savings goals, Digit texts you cheeky congratulatory messages featuring GIFs of killer whales and Bill Murray. That’s something to look forward to, right? Sure, growing your savings is great, but who doesn’t want to save some dough on their next shopping spree? This free coupon app — spun off from its popular namesake website — scours the web for deals and coupons from more than 50,000 retailers. It then delivers them as barcode scannable and printable digital coupons that you can redeem right from your smartphone screen. You can also use RetailMeNot to set up customizable notifications so you’ll always be on top of the latest in-store and online deals. Major retailers featured on the site include Amazon, Home Depot, Kohl’s, Old Navy, Target, Staples and more. The app also tracks several national chain restaurants — including Papa John’s, KFC, Chili’s, Olive Garden, Red Lobster — for special deals and discounts. To discover deals, you can either browse retailers by category (Accessories, Automotive, Beauty, Books, etc.) or by using the app’s keyword search. The visually simple app also has a helpful “Nearby” map feature so that you can see the deals closest to your location (per your device’s GPS coordinates). 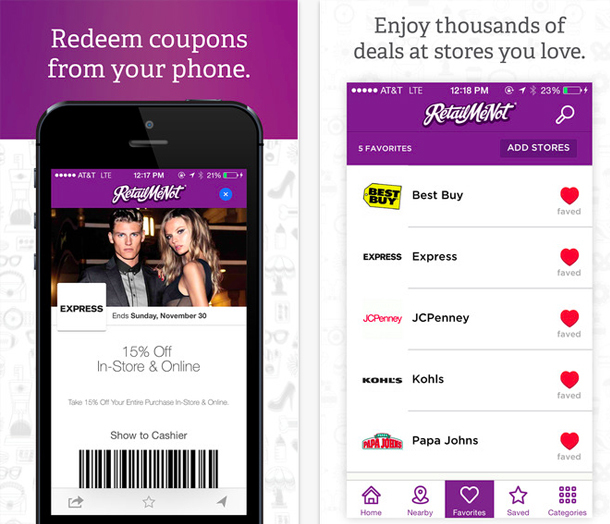 RetailMeNot is available for iOS and Android devices. While you’re out shopping, you might as well save a few bucks at the gas pump, right? Every cent saved is another penny you can put back into your budget (uh, and you do have a budget, don’t you?). 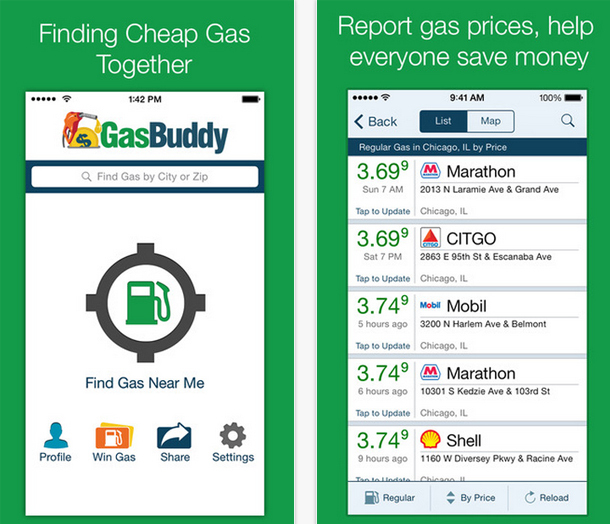 GasBuddy, a free user data-driven app, can help you cut down on your gasoline costs by directing you to gas stations that sell the cheapest gas near you. The best part, other than saving on gas, is that GasBuddy does this in a fun, gamified way, similar to Waze, hooking you up with points and snazzy new car icons as you report gas prices. Also, the more prices you report, the better shot you have of gracing the GasBuddy leaderboard. Available for iOS and Android devices, the app draws on user-supplied gas price information to “drive” you to the lowest gas prices in your area, based on your device’s GPS location. The prices are displayed on a map, but you can also search for them by city or ZIP code.